Miracles! | You Can Succeed Now! MIRACLES. According to Exodus in the Old Testament of the Holy Bible, there are 72 Names of God. 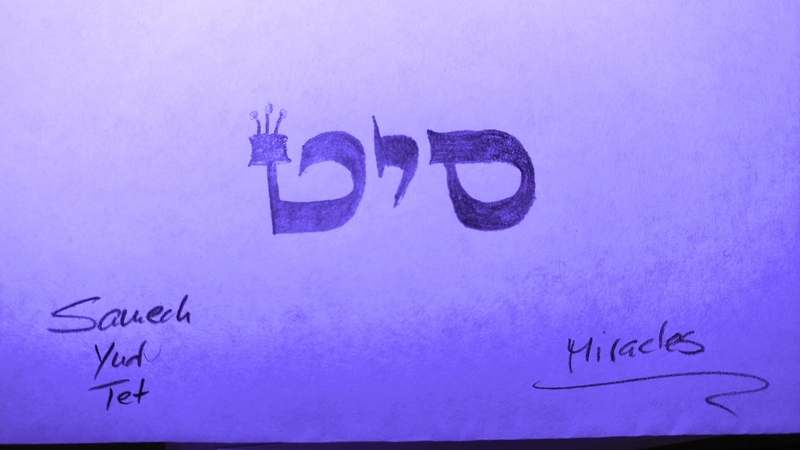 The name you see here is the Hebrew name for MIRACLES. Think of these three glyphs as a three-pronged electrical plug. When you look at this name, the vibration of MIRACLES plugs into your brain and helps you attract miracles. It is the law of attraction in its most direct form. Don’t make work out of it, just look and allow, go about your business (action is important in the equation), then receive with grace and gratitude. Make some copies of this image. Place them where you can notice them, and give some away. It seems to me we can all use a few miracles right about now. Watch what happens when you adopt this spiritual practice. Yehuda Berg wrote an exquisite book called. “The 72 Names of God”, available on Amazon. It is such a gift to us all. My Israeli artist friend Orna has an amazing website, KabbalahInsights.Com. You will find her site an adventure in spiritual development. She even has a free download for you on the 72 Names of God there! Thank you, Daniela, for your excellent scribe work! Thank YOU, dear reader, for visiting Spiritualiving.com today!